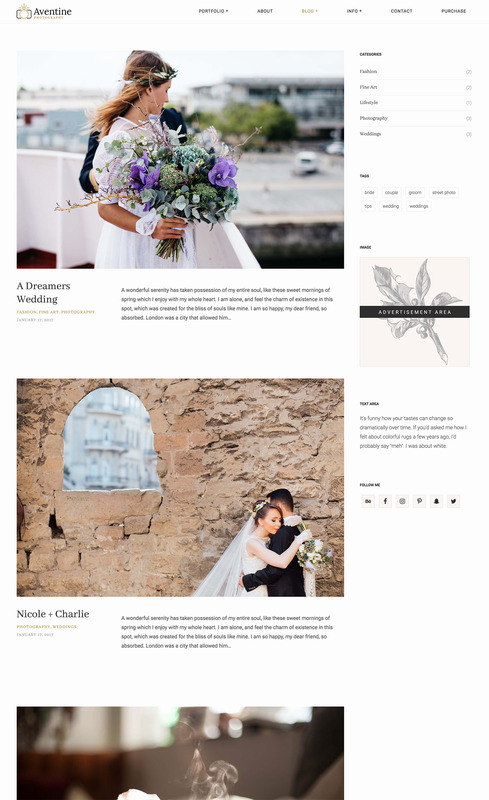 Aventine Portfolio is an elegant, sophisticated WordPress theme with an almost dreamy feel. 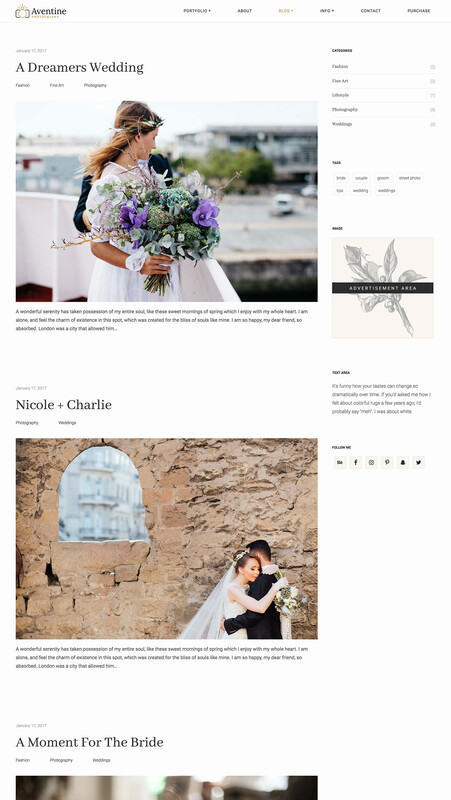 Designed for photographers it’s meant to compliment any wedding, engagement, portrait or fine art photographer who is looking for a simple yet elegant way to showcase their portfolio online. Although we cater to photographers, in general, this theme was designed from start to finish with the wedding photographer in mind. Filled with little lines and borders, subtle animations, and parallax background images for the header and footer area this theme is meant to help you enchant your potential clients. Aventines main features include horizontal scroll galleries that show your images in a full-screen view without cropping them. 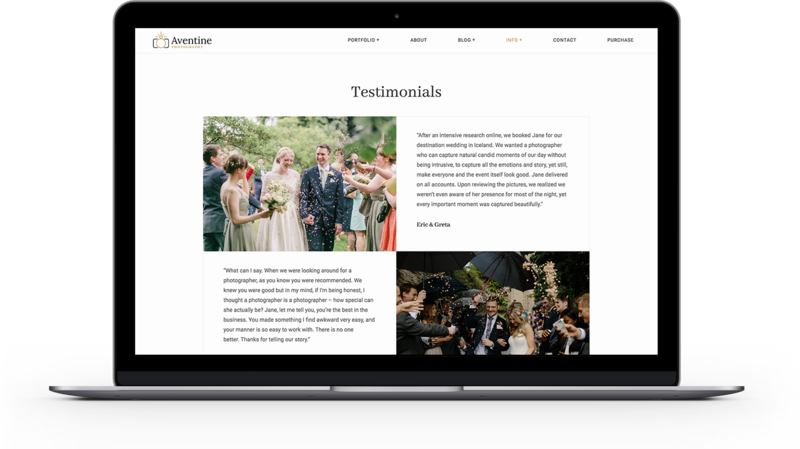 Aventine uses the Easy Photography Portfolio plugin that lets you create easy to use masonry style portfolio pages with an option to create multiple portfolio pages with different galleries in each. Beautiful typography that makes it easy to read and feels clean and clutter free. Multiple blog layout options with galleries inside posts. Aventine theme is fully responsive, retina-ready and optimized to make sure your website is accessible from any device. Aventine portfolio pages consist of three column masonry layout. Each gallery can have both a title and a subtitle. The portfolio page is filled with subtle, delicate mouse-over animations that make the site fill fine-tuned and professional. Aventine can have either one portfolio page or multiple portfolio pages with different galleries in each one. 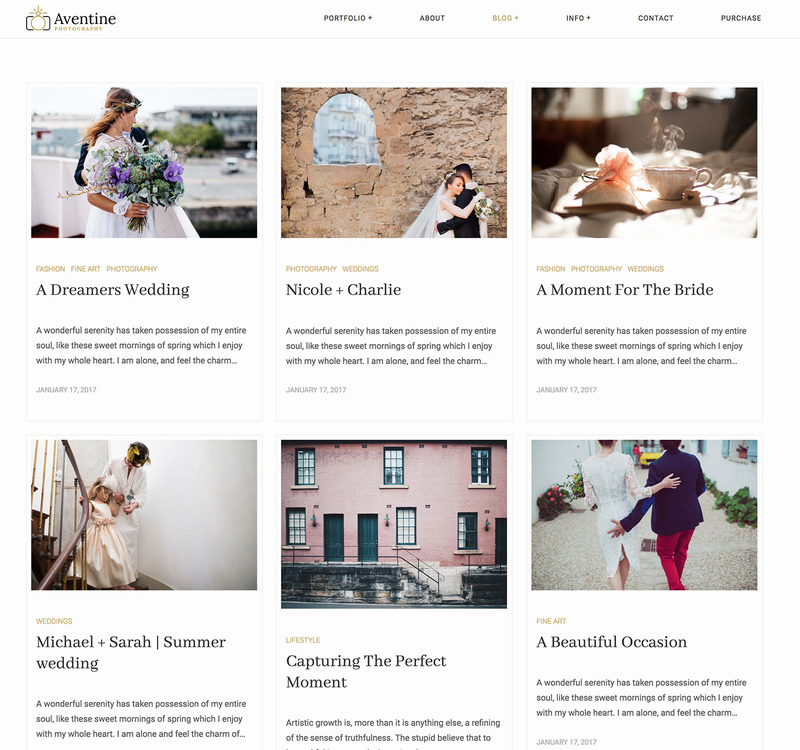 Aventine photography theme is designed to showcase your work. You can choose between two gallery layouts for your work – horizontally scrolling gallery or masonry. No matter which layout you choose, all images can be opened up in a full-screen gallery pop-up that comes with autoplay, social sharing, and thumbnails. Even Aventine blog posts can be used to create beautiful galleries in them. Aventine horizontal galleries are fast loading, smooth and easy to navigate. All images auto resize to the same height so while keeping the image quality. This creates a unified, immersive look.You can add a beautifully designed text block in each gallery to tell something special about the photo shoot. Aventine has three different blog layouts plus an option to disable and enable the sidebar area. 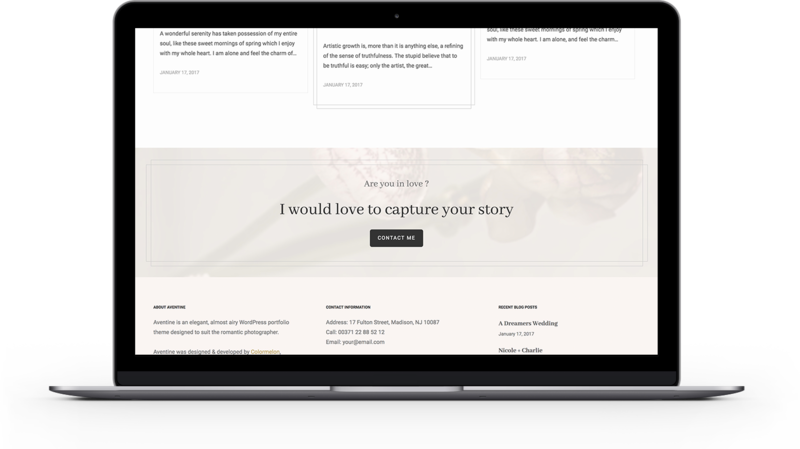 Masonry blog layout arranges your blog post in three columns similar to the Aventine portfolio page layout. Modern blog layout arranges your posts in one column with featured image on top and title with blog post excerpt under neath it in two columns. For a more classic and familiar look, you can choose the Classic blog post layout where the post title is shown first, followed by the featured image and a short post excerpt. 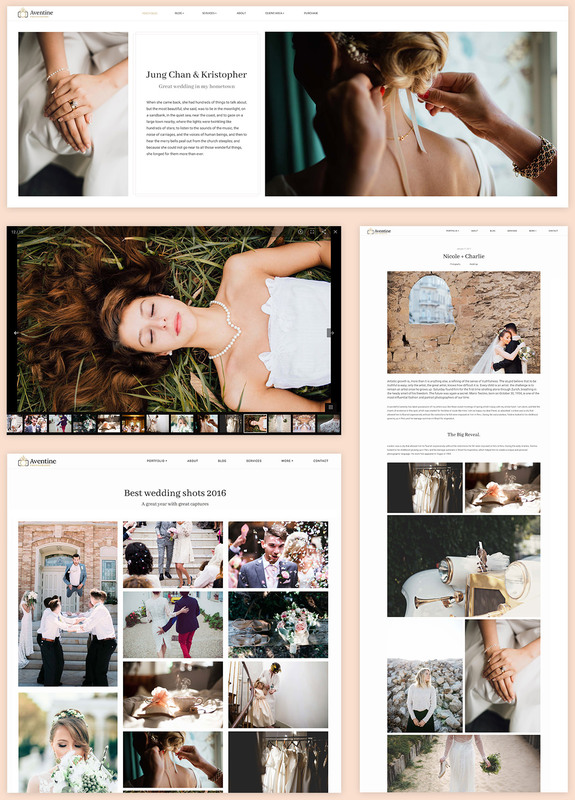 Aventine Photography theme was designed to help you land the clients of your dreams. 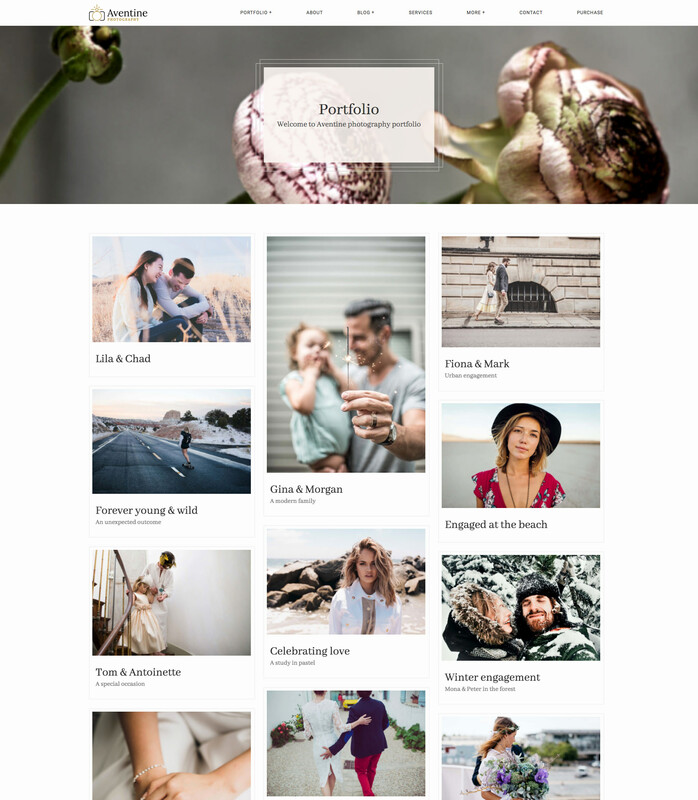 This theme is not only a pretty layout for your images but an actual tool for you to use in order to sell your services. Help your clients contact you! Each vertically scrolling page can have a handy Call to Action area above footer. This area is fully customizable so you can add a custom background image, text and button. Describe the services you provide by using Aventine Services blocks. Testimonials from previous clients can help you land new jobs. So say no to ugly, boring testimonials pages! List your praise in an elegant, easy to use and navigate block layout. 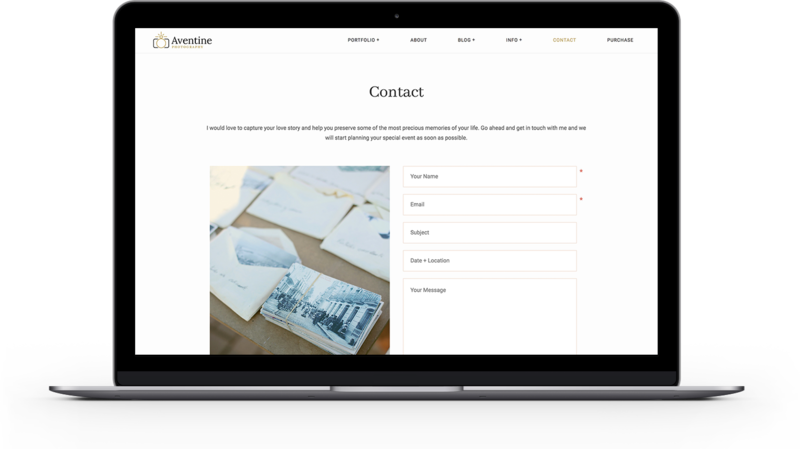 Your contact page is where your clients can reach you so we made sure that Aventine contact page and form looks extra nice. Not sure if you’ll be able to set the theme up all by yourself? Don’t worry, we have a handy online documentation, support forum, and a full setup guide video tutorial (see below) so you’re covered! So what are you waiting for – check out Aventine in action now!